Football is one game that has fans across the world and you can hardly find a country where football is not played or watched. Thanks to Football Champions Cup slots game for such a wonderful theme that brings gamblers and football fans together to win some good money. The game starts with a loud cheer from the crowd and you get to pick your famous international team with the respective country flag. The flag will be displayed at the bottom throughout the game that keeps your patriotism spirit high. This is a 5 reel and 10 payline slot that allows you to bet from £0.20 to £100 per spin. The developer is none other than NetEnt, a gaming company popular from bringing some amazing and creative themes in their slots that keep game players glued to their computers and mobile devices. They have over 20 years of experience in slot gaming and have always been successful in meeting user expectations. This Football Champions Cup slots game has five high-value symbols; footballer in action, a jersey, a shoe, a sports glove and a referee whistle and footballer is the high value that awards you 1000 times your stake when 5 symbols land on a payline. There are some bonus symbols which are a football, golden trophy, and the word ‘Bonus’. ● Wild Feature: The football with Wild mentioned on it substitutes for all except the scatter and bonus symbols. The wild also awards up to 2000 times the stake when 5 symbols appear on a payline. ● Scatter Feature: The golden trophy cup is the scatter symbol of Football Champions Cup slots and it awards free spins when three of them land anywhere on reels 2, 3, and 4. Once you get 3 scatters you get to enter a free spins tournament where you need to win all the four matches to get the cash prize. There are four rounds with 6 spins each and you will have to score in the knockout phase to proceed to next level. ● Red & Blue Wilds: These wilds appear during free spins; blue appears only on reels 1 & 2, while red can appear on 4th & 5th reel. Blue scores a goal for your team and red scores for the opponent. 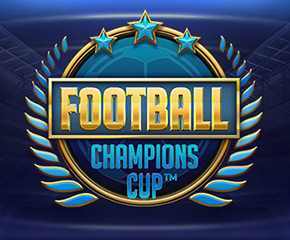 Football Champions Cup slots is one of a kind game that is based on real life football tournament and offers bonus games where you can kick the ball as well as save being a goalkeeper. The amazing mix of gambling and football in one single online game.